Combine ingredients for the dressing in a small bowl and refrigerate, allowing the flavors open up for at least 1-2 hours before assembling the pasta salad. Now, you can use a thick pre-made dressing such as Marzetti’s Chunky Blue Cheese if you are pressed for time, but I recommend against it if at all possible. Homemade blue cheese dressing — really all salad dressing — just tastes better and has fewer additives than manufactured dressing. It’s so easy to make, you’ll wonder why you didn’t start making your own sooner. The dressing above is also a a little thicker than normal dressing by design as not to make the pasta salad too runny or just generally gloppy. Season the chicken with dash of salt and pepper, lightly coat with olive oil and then cook either in a 350º oven for 20-25 minutes or saute on the stove top with a small bit more of olive oil over medium high heat, 4-5 minutes a side. Allow the meat to cool slightly and then chop. In a large skillet, melt the butter over medium heat and saute the garlic for a minute or two. Toss in the chicken to coat and then mix in the hot sauce. Drain any excess hot sauce mixture from the chicken and chill while making the pasta. Cook the pasta al dente with salted water dash of olive oil as per package directions. Drain and rinse with cold water, shaking out all the excess water as thoroughly as possible. 1 cup scallions chopped plus a small handful for garnish, about 3-4 scallions. 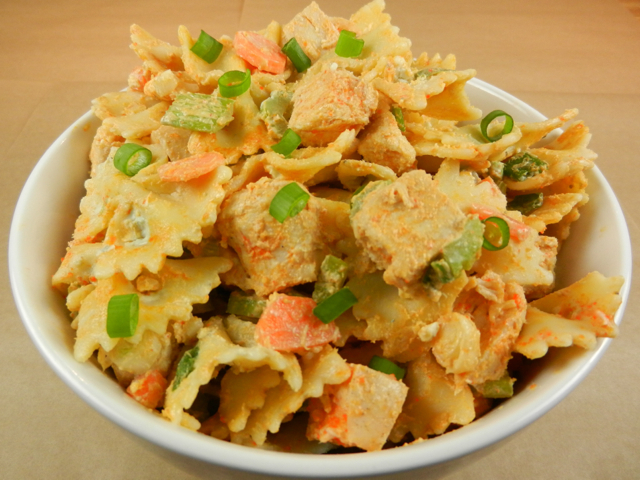 In a very large bowl, toss together the pasta, dressing, celery, carrots and scallions. Fold in the hot sauced chicken. Garnish with remaining scallions. Serve immediately or refrigerate for later. Tip: Sometimes pasta salads or potato salads dry out a small bit when left in the fridge for more than 24 hours. Stir in a tablespoon or so of sour cream to add back moisture and return to desired consistency. Still time to join the Football Foodies annual NFL pick’em league. You’ve only missed one game! You might also like: Orzo Pasta Salad, Buffalo Chicken Dip Buffalo Chicken Wontons, Blue Cheese Pierogies with Buffalo Sauce, Shredded Buffalo Chicken Wraps, Buffalo Chicken Meatballs. Google Voice number available for emergency recipe questions and texts (323) 963-4756, 9 AM PT – 10 PM PT, Saturday and Sundays. Season the chicken with a dash of salt and pepper, lightly coat with olive oil and then cook either in a 350º oven for 20-25 minutes or saute on the stove top with a small bit more of olive oil over medium high heat, 4-5 minutes a side. Allow the meat to cool slightly and then chop. In a large skillet, melt the butter over medium heat and saute the garlic for a minute or two. Toss in the chicken to coat and then mix in the hot sauce. Cook the pasta al dente with salted water dash of olive oil as per package directions. Drain and rinse with cold water, shaking out all the excess water as thoroughly as possible. 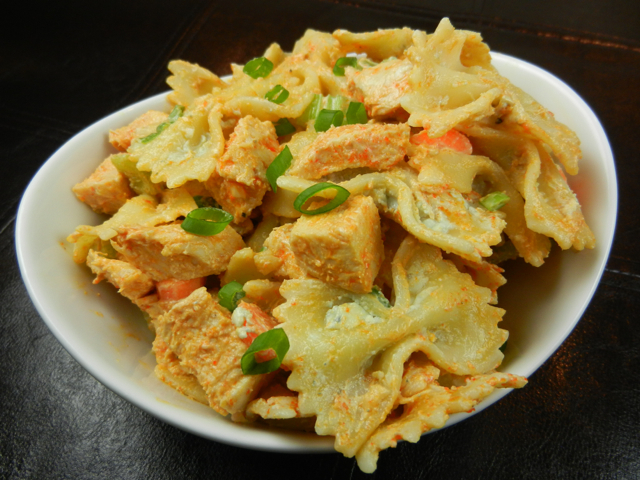 In a very large bowl, toss together the pasta, dressing, celery, carrots and scallions. Fold in the hot sauced chicken. Prep time includes resting the salad dressing before assembling. Tip: Sometimes pasta salads or potato salads dry out a small bit when left in the fridge for more than 24 hours. Stir in a tablespoon or so of sour cream to add back moisture and return to desired consistency.